Trace Trails entrance is on the right off of County Road 3914 in Athens, TX. Directions: From the intersection of Texas Loop 7 and US 175 head northwest towards Mabank on US 175 for approximately two miles. Turn right on Co. Rd. 3918. Follow this road around a 90 degree curve to the right, then take the first left, which is Co. Rd. 3914 (you will also see signs for Tara Winery). Co. Rd. 3914 is narrow and curvy. Pass the winery on your left (it’s a two story white house with large pillars and a vineyard — you can’t miss it). Continue on 3914. After a curve in the road you will see a silver gate on your left — pass this gate and continue on Co. Rd. 3914. Trace Trails will be on your right and easily seen from the road. From Co. Rd. 3914 it is approximately 1.7 miles. The campground is in a large tree lined meadow. There is a wooden sign placed on two metal barrels. Open field parking offers lots of room and maneuverability for large rigs at Trace Trails in Athens. Fee drop box is done by the honor system at Trace Trails. Fees: Fees are paid by way of the honor system. 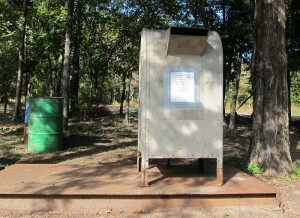 There is a metal drop box located to the left of the entrance road under some shade trees. Just drop in your payment and enjoy the trails. Operating Hours: These trails are normally open 24/7 with some exceptions. On occasion for large events like an endurance race in which 100 or more riders will participate, the trails might be closed to those not participating in the event. So it is always best to call before you haul. Shady camping / parking areas at Trace Trails in Athens, TX. Facilities: Primitive camping grounds are located in a large tree lined meadow. There is no electricity and there are no designated campsites, so you can pick where you want to park or camp. There is one porta-potty, a few picnic tables, a fire ring, and two water faucets with metal water troughs. Water hoses were attached to the faucets but I do not know if they belonged to another visitor or were provided by the ranch. I’d suggest you bring your own water hose. 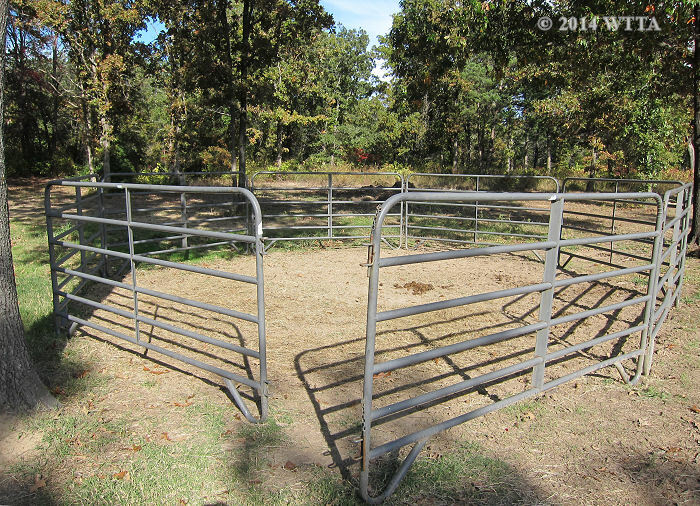 There is one horse pen constructed out of 8 metal panels. The pen is not covered but is located under some shade trees. You may high tie to trees so long as you use tree savers or something like a girth to protect the trees. You may also bring portable or electric pens. On the north side of the camping area (to the left as you drive in) there are some shady places to park, otherwise you can park along the tree line or out in the open field. It is first come, first served with regard to parking and/or camping locations. The water faucets, pen, picnic tables, fire ring, and porta-potty are located to the left (or north) side of the campground under the trees. There is a single horse pen at Trace Trails which has eight metal panels and is under shade trees. 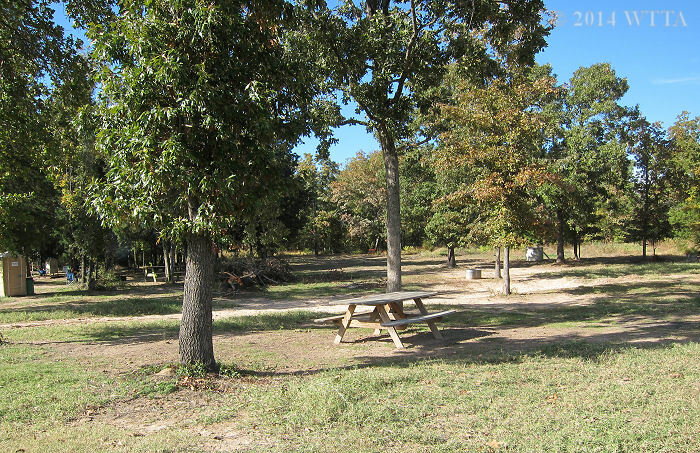 Campground at Trace Trails in Athens, TX. Dogs: Dogs are allowed and may be loose so long as they are well behaved… otherwise please keep your dog on a leash. Be aware that some of the trails go near residences who have dogs, and we had two dogs try to chase after our horses. However, as soon as we turned our horses around facing the dogs they backed off. During one of our rides at the ranch a fellow equestrian had her well behaved dog tag along down the trails with us and he was having a blast. Cell Phone Service: Cell phone service was strong and I had no problems using my Verizon cell phone. 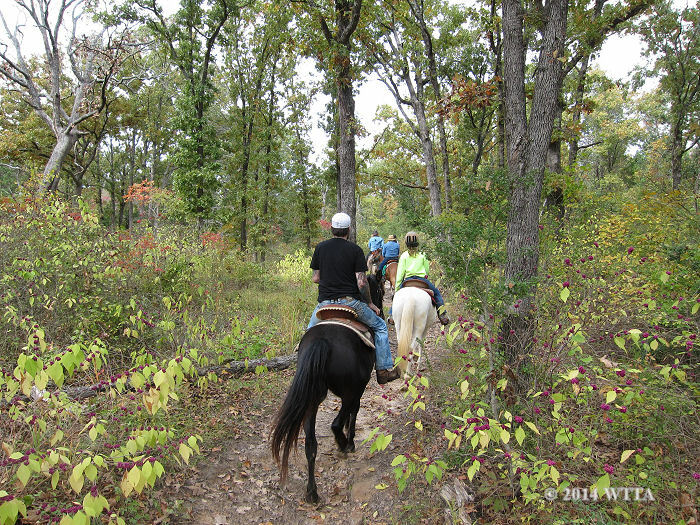 Trail Users: Trail users consists of mostly equestrians and maybe an occasional hiker. There are no motorized vehicles or bikes on these trails. 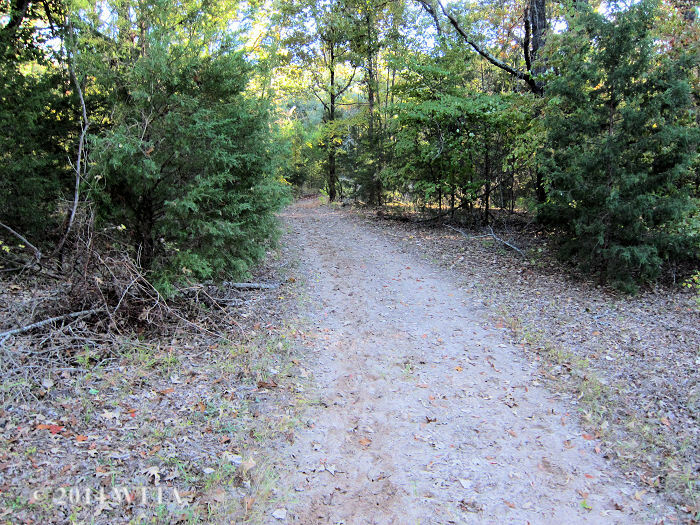 Mileage: According to the owner, Mr. Beeson, there are more than 50 miles of trails on the 1,000 acre property. The trails are color coded. There are multiple cut-through trails marked by yellow and green ribbons for which the mileage is unknown. Maps: Go to the Trace Trails FaceBook page to see additional maps. The green asterisk is where the campgrounds are located (this map is on the Trace Trails Facebook page). Trail Markers: The trails are well marked with colored ribbons (some colors are faded), white signs with colored arrows, and pie plates. The property fence line, telephone poles, gas line, blacktop road, and dirt road make great guides to also help you find your way around. The trails heading out of camp are fairly easy to find. Several of the trails start out north of the water troughs and others start out on the edges of the tree line. You can also go to the very south of the campground meadow to pick up the trails as well. Trail marking: the ribbons are on the right side of the trail as you’re leaving camp on the start of the trail as indicated on the maps. Turns are shown by three markers on the side to make the turn or by an arrow. Several competitions are held here each year including endurance rides, trail competitions with NATRAC and ACTHA and all of these folks put in LOTS of hours to keep the trails maintained and marked. Thank you all!!! Additional thanks to the Beeson family for allowing us to ride on their lovely ranch!!! And thanks to GOD for creating this lovely place and allowing us to care for it and our horses. Trail signs at Trace Trails in Athens, TX. Terrain: The soil is sandy and mostly free of rocks; shoes/boots are not required for your horse. The sand can be deep in some areas. This is a great place to ride if there has been rain, as the sandy soil drains quickly and therefore the mud and bog dries up fast. The trails can be dusty if there has been no rain. The trails take you through wide open grassy meadows and thick forests. The terrain is mostly level or gentle rolling slopes. The Green and Yellow cut-through trails usually cut across thick woods and wind in and out of creeks and gullies providing more challenging terrain. There are more ups and downs, creek crossings, and deadfall on these cut-through trails. 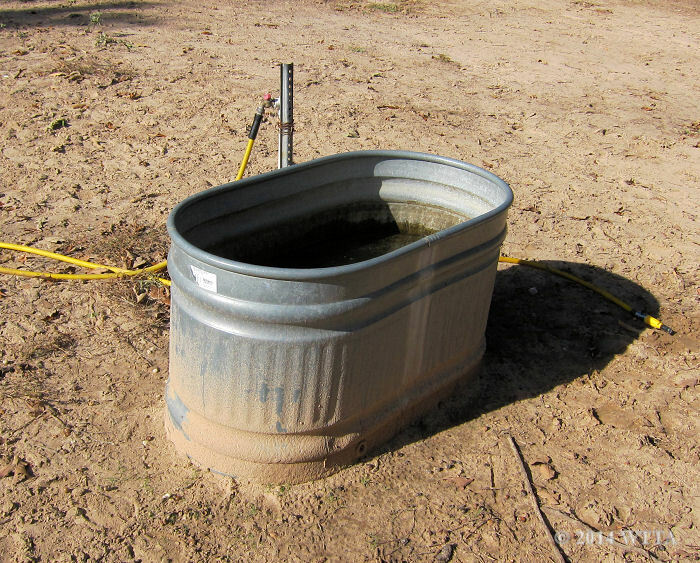 This stock tank is not far from the campground at Trace Trails. Water: There are two water faucets with troughs at the campground. On the trail I saw one stock tank and a few creeks from which the horses were able to drink. 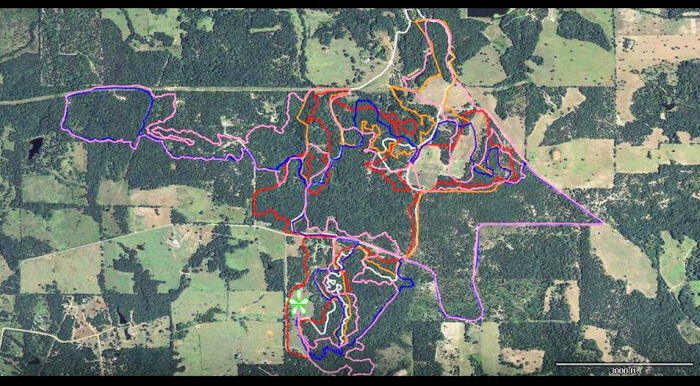 Trace Trails in Athens, Texas is a privately owned 1,000 acre working cattle ranch in northeast Texas. 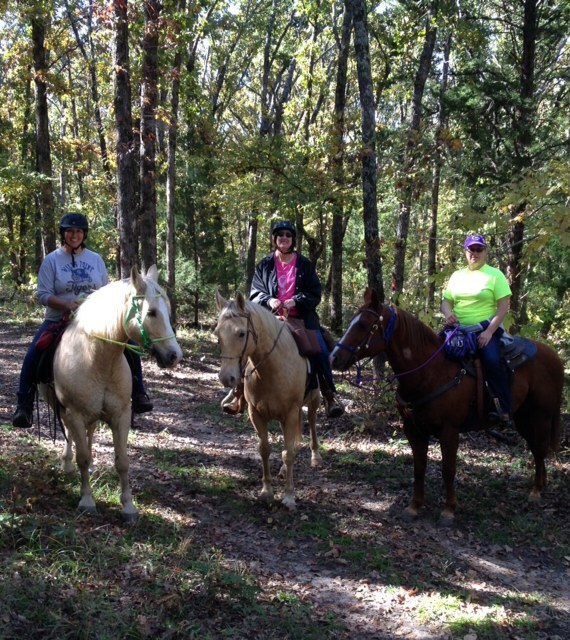 This ranch offers over 50 miles of sandy and scenic trails to enjoy with your friends, family, and horses. Dogs are allowed and may be loose so long as they are well behaved, otherwise please keep your dog on a leash. During one of our rides at the ranch a fellow equestrian had her well behaved dog tag along down the trails with us and he was having a blast. 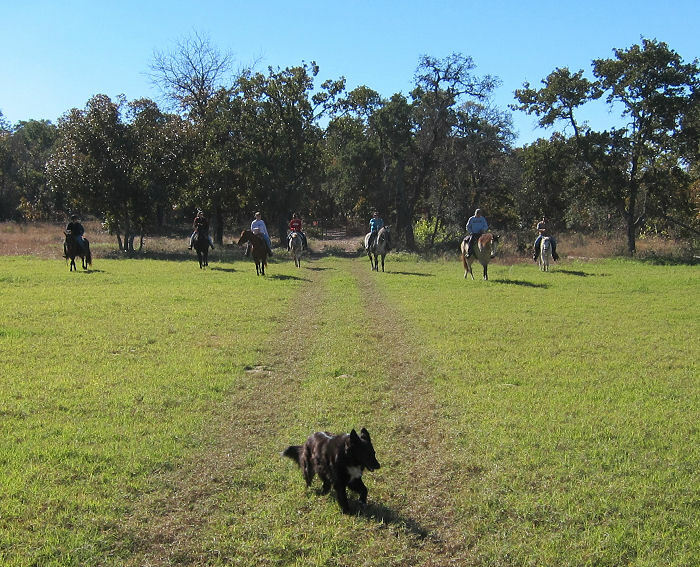 The ranch often hosts trail competitions, benefit rides, and endurance races. 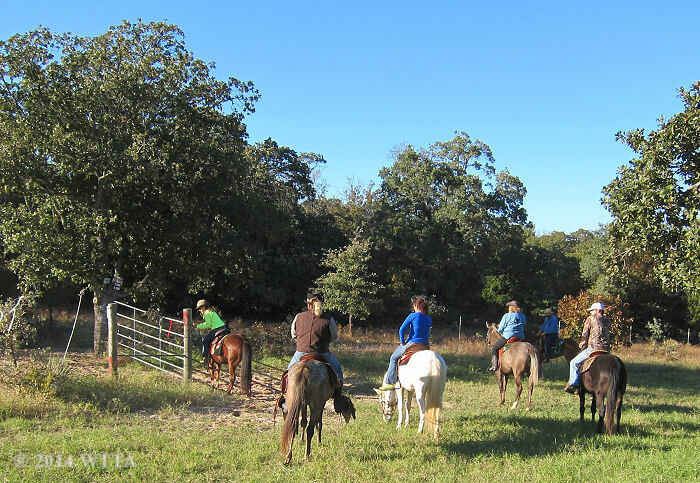 You are welcome to bring your own horse anytime to ride at Trace Trails, but you might want to call first to find out if there is an organized event also going on. Some of the endurance races held there can have as many as 100 riders. Ranch use fees are very affordable and everyone pays by the honor system by depositing their fees in the drop box. Overnight equestrian camping is primitive in that there are no electrical hook ups or designated camping pads. 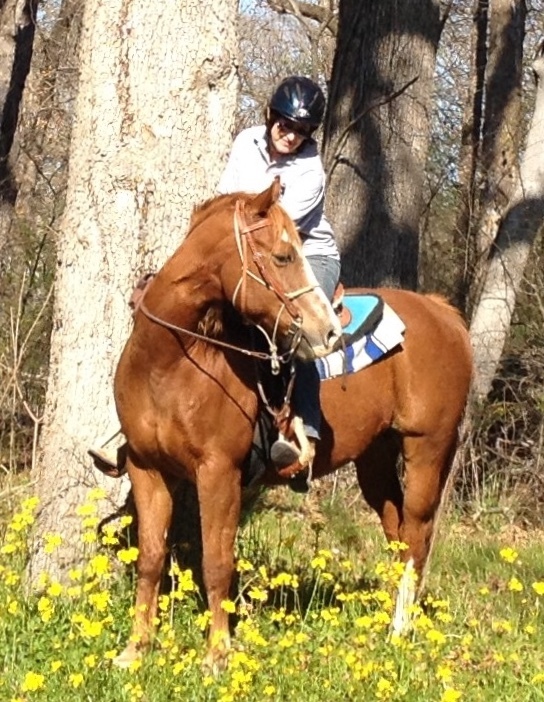 Patti is riding Dakota through the thick woods at Trace Trails. This is a great place to camp and ride, especially since there are numerous miles of trails. The trails are diverse with flat to rolling sandy terrain, open grassy meadows, and thick forests. The yellow and green cut-through trails wind through thick forests and in and out of gullies and creeks; these were my favorite trails. 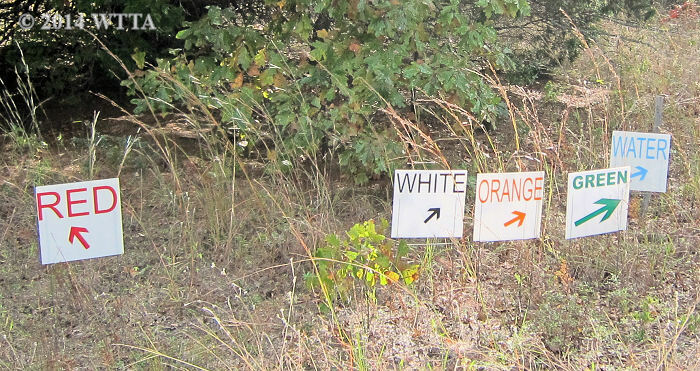 The trails are well marked with colored ribbons — although some colors are faded — and white signs with colored arrows, and pie plates. The property fence line, telephone poles, gas line, blacktop road, and dirt road make great guides to also help you find your way around. 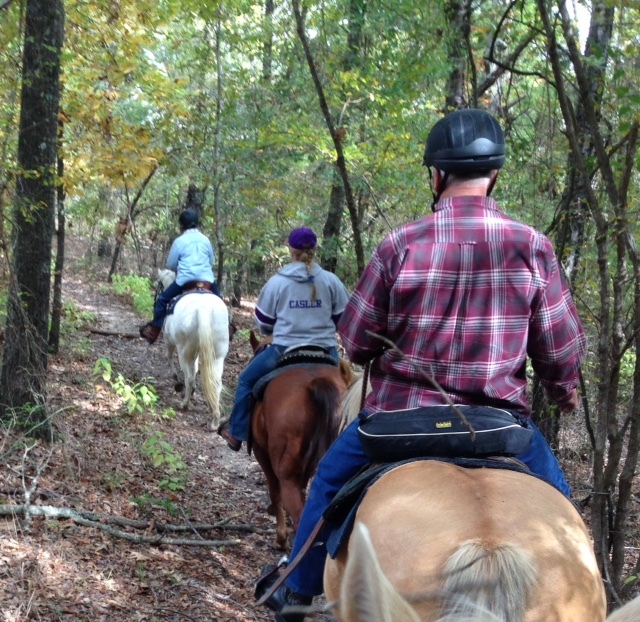 Heading out on the trails at Trace Trails in Athens. The purple beauty-berries were everywhere. Photo shot by Donna Taker. Ann and Scout, her long time, much loved, trail companion. I’ve probably ridden at Trace Trails in Athens 7-8 times, but I haven’t ridden there for a couple of years prior to this trip and have never been brave enough to camp out without electricity!! So this trip was a welcome return back to a place where I’ve had some great rides. In the past we had jumped from trail to trail, never going from start to finish, and I always thought I was probably missing a lot of good trails. I was so RIGHT!! My friend Jackie and I arrived Friday mid-day and got busy setting up camp; stringing the highline and setting up the generator. We decided to ride a portion of the red trail. It leaves out of camp on the north end, crosses a county road that is not paved, and through a gate into a large pasture. It took a team effort to open and close the gate but at least we didn’t have to dismount! The trail went through an open pasture and then into the woods. The trails are sandy, wide, shady and well marked. We rode the north loop of the trail, probably about 4 miles and it was beautiful; gently rolling hills through heavy forest. There were some gentle ups and downs, and we passed by a deer stand (no one home). 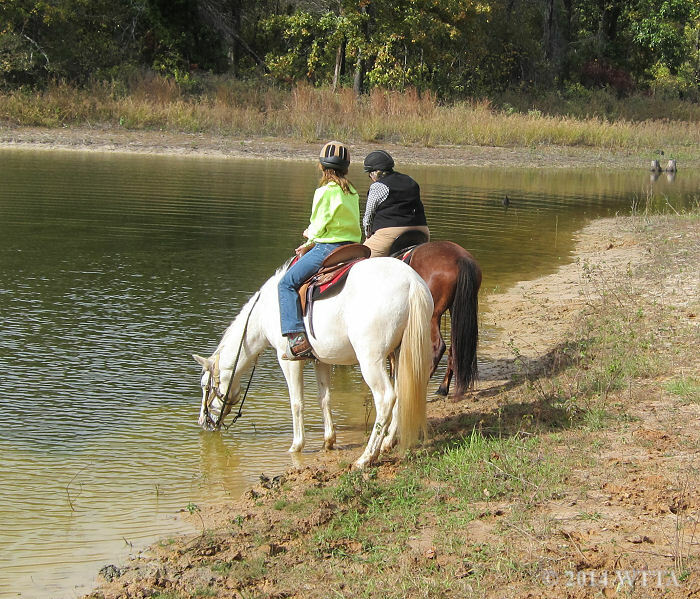 We stopped by a pond about halfway into the ride for the horses to rest and get a drink. We took the “scenic loop” and it was a little higher with some very nice views. The entire trail is through woods, and it was truly a delight. We were joined in the camp by a local cowboy church, Living for the Brand, and they were great campers!! They cut up a fallen tree and stacked firewood, started a fire, and invited us for supper, breakfast, and lunch!!! They were real nice folks and we enjoyed getting to know them. 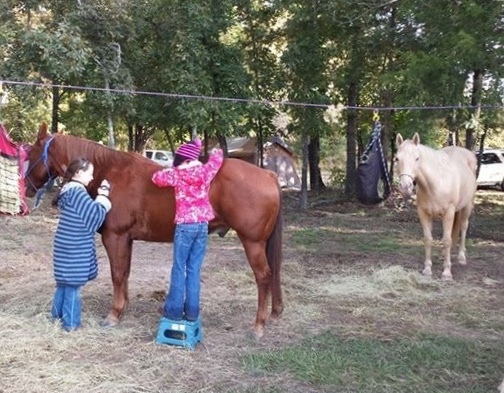 There were two girls with the cowboy church that were horse crazy and loved on the horses. Jax on the right is saying “What about me?” Photo provided by Ann Sides. The 2nd day we were joined by Brenda and Henry McNair, who are some great folks that helped me start trail riding and camping. They brought their wonderful horses CJ & Sunny. CJ is a gray Appaloosa and Walker combination and Sunny is a Palomino QH. 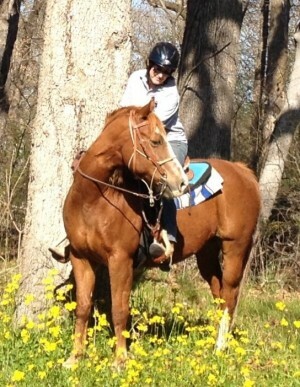 CJ is one of the steadiest trail horses I’ve ever been around. His only problem is that he sometimes falls asleep while he’s walking!! After a wonderful breakfast of pancakes and sausage provided by the Cowboy Church we rode out on the Pink Trail from the north end. We planned to ride 2 hours so we only rode the inside loop of the Pink Trail, which is in the same area as the loop of the Red Trail that we rode on Friday. This portion of the pink Trail has very heavy woods and sandy, shaded trails. The south portion of the pink trail includes 3 miles of road riding on very lightly traveled dirt roads. Brenda and CJ in front, Jacki and Frisco, and Henry and Sunny. Photo provided by Ann Sides. After a big lunch of hamburgers, again provided by the Cowboy Church, and lots of good visiting around the campfire, Henry & Brenda left for their home in nearby Wills Point. We decided on a short ride and left out on the south end of the Red Trail. We planned to just hop around on whatever trail took our fancy. This end of the trails has a lot of ups and downs and is very heavily wooded, but as usual well trimmed and marked. Jacki spotted a deer not far out of camp. Saturday evening we were joined by Annette Griffin and her two horses, Tally, a Paint and Percheron combination, and Mister Man Griffin, (Mister for short) a Haflinger and POA combination. Annette competes in NATRAC on Tally and recently won Sweepstakes in their first year of competing together!! We were joined on Sunday morning by Julie Whitaker and a Paint horse she was trying out named Laredo; a really pretty horse with one blue eye. We rode the Orange Trail, which starts in the south end of the meadow. It was spectacular with some good ups and downs; lovely, lovely ride. This took us way back on the ranch to places I’ve never been. We went through several large pastures and stopped by a nice sized pond for the horses to drink. I finally rode one trail start to finish!!!! Julie and Laredo in front, and Annette and Mister. Photo provided by Ann Sides. 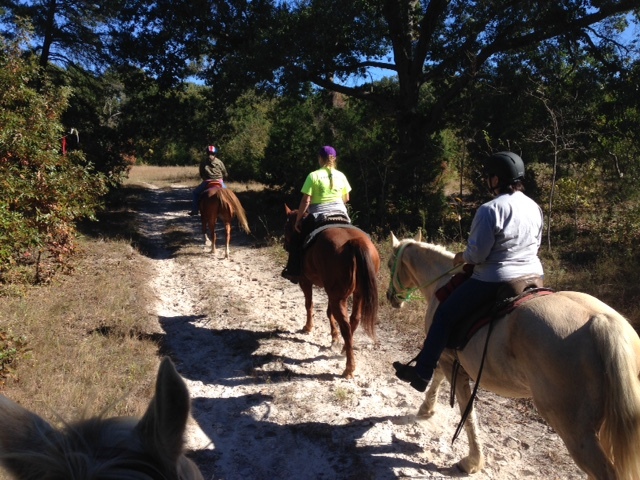 Julie in front, Jacki and Frisco in middle and Annette and Mister, accompanied by our shadow horses! Photo taken by Julie Whitaker. Annette and Mister on left, myself and Jax in middle and Jacki and Frisco on the right. Photo provided by Ann Sides. I had the opportunity to visit Trace Trails due to last minute changes in our camping plans on account of the weather. Our original destination was a muddy mess, but since Trace Trails is sandy, the water drains through the soil quickly and that means little to no mud after several days of rain. 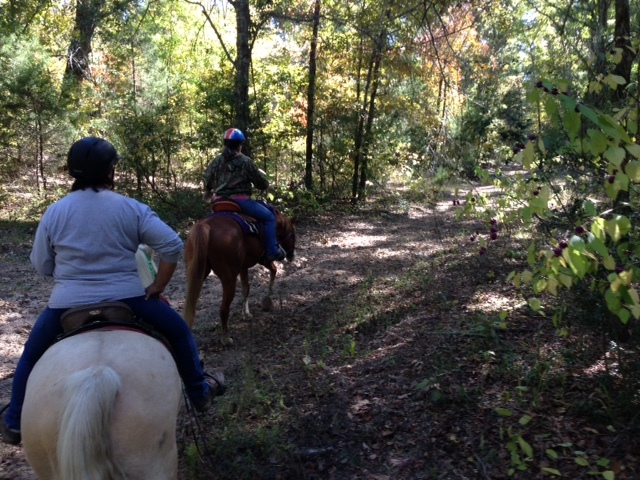 I joined my American Indian Horse riding club, NETASA, to enjoy Trace Trails during a fall weekend in November. 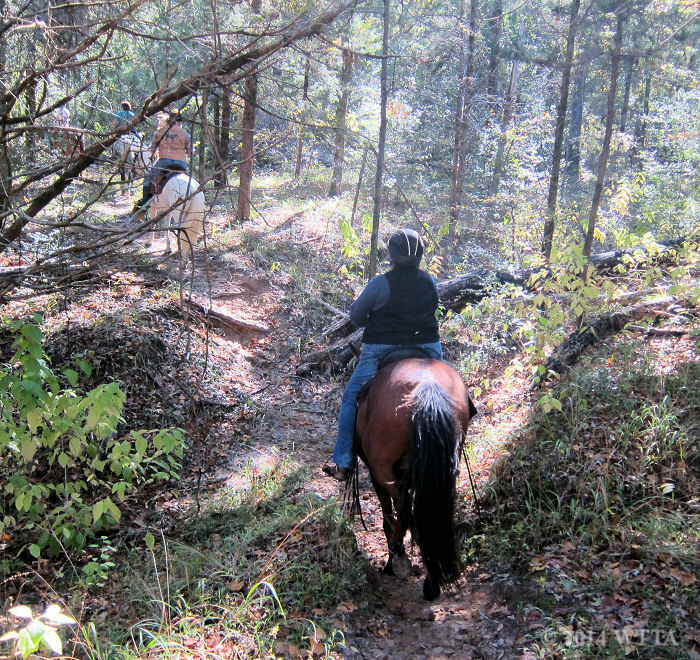 NETASA, an American Indian Horse trail riding club, enjoys Trace Trails in November. The leaves were starting to turn and the bright purple beauty berries were everywhere. This is a working cattle ranch so there are roaming cattle throughout and gates to open and closed as you ride through the property. During our short weekend visit to Trace Trails I ran into some old friends (Shirley & Vern) by chance, which was a pleasant surprise. 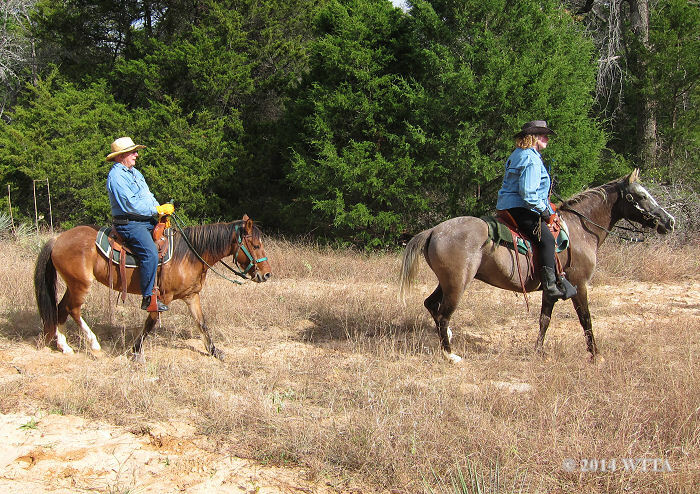 Vern and Shirley live nearby and enjoy riding their Rocky Mountain horses with their riding club, Trail Gaiters and Friends, at Trace Trails. Vern and Shirley had brought their Rocky Mountain horses to the ranch and were meeting up with their riding club “Trail Gaiters and Friends.” Our two clubs met together to ride some of the trails and we had a fun time. Overall it was a great weekend with cool weather for a campfire, good friends and family, good horses, super trails, and good food! I’m looking forward to riding at Trace Trails again. It is definitely worthy of a return trip. 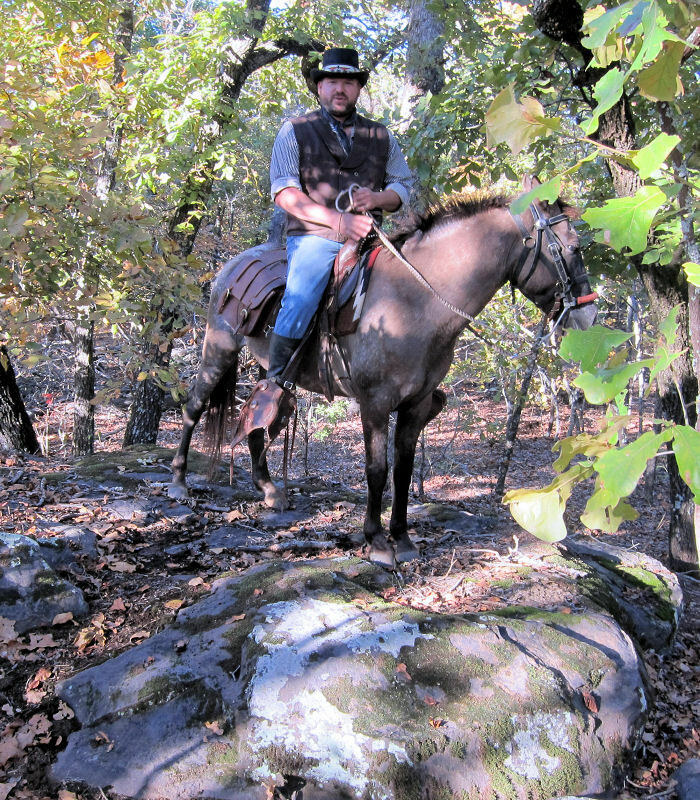 Curtis George, riding Dragonfly, shows me rock formations which are hiding in the shadows of the forest just off the trail. 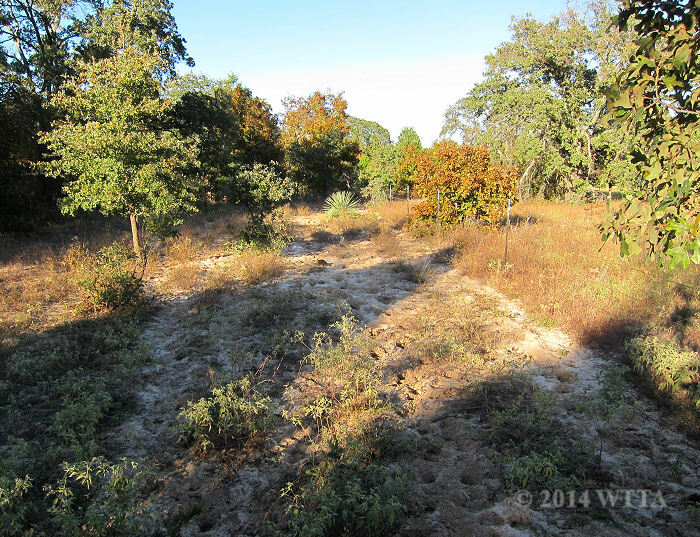 This terrain is unusual for the ranch as most of the ground is sandy with little to no rocks. During this trip Curtis with NETASA showed me all sides of the ranch. Since this was my first trip to Trace Trails and because we didn’t always stick to one trail in particular (as it was fun to ride the cut through trails and jump around to different trails), I don’t have a good description of each individual trail. If you know these trails well and can give a good description of each of the colored trails then please email the info to me and I’ll add it on this page. I also invite others to share their reviews of the trails as well and I will share the information here. 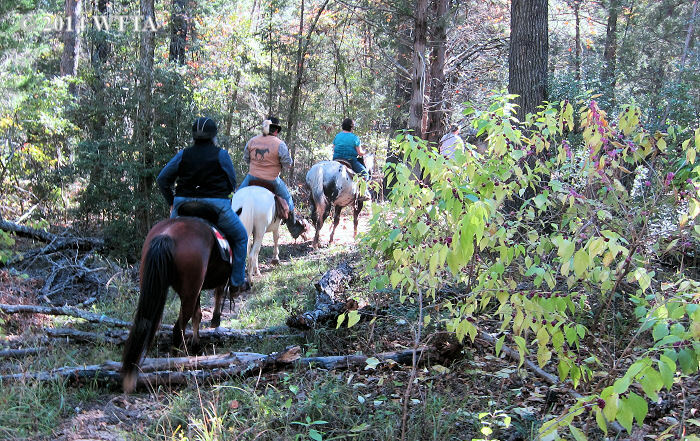 Riding clubs NETASA and Trail Gaiters and Friends ride through a forest trail in Athens, TX. There are several deep sandy trails at Trace Trails. A new friend made at Trace Trails, Ann Sides, showed me a neat trick she learned from other trail riders to get your high tie nice and tight – use a come along hoist. Thanks Ann! 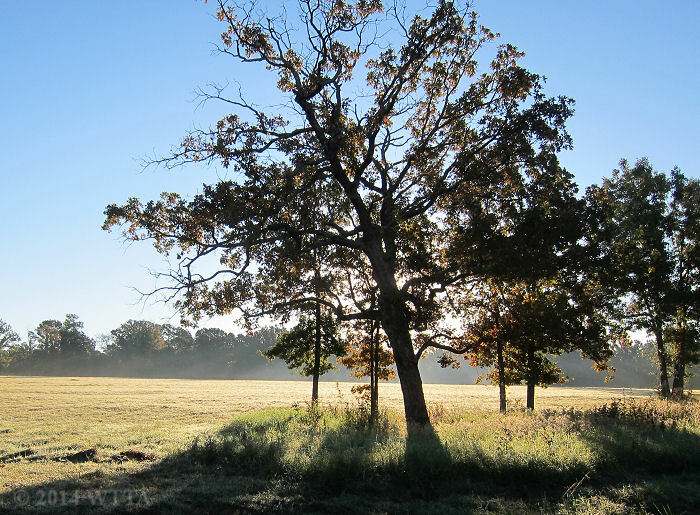 A post oak tree is highlighted by the early morning sun at Trace Trails. 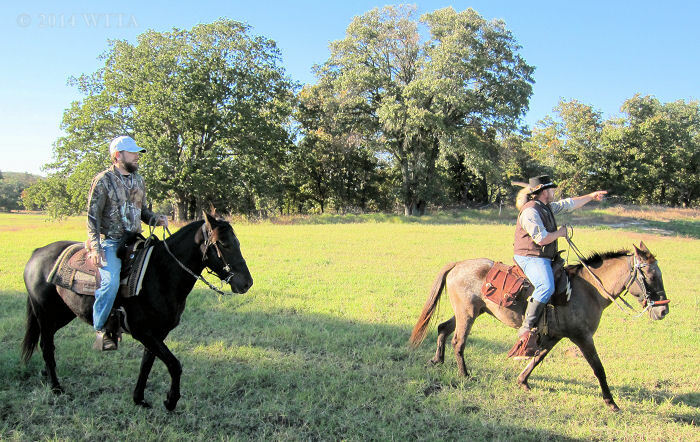 Curtis and Scott enjoying the open meadow trails in Athens, TX. Emily kindly opens the gate for us at Trace Trails. Due to cattle on the ranch it is important to always close the gate once everyone is through. 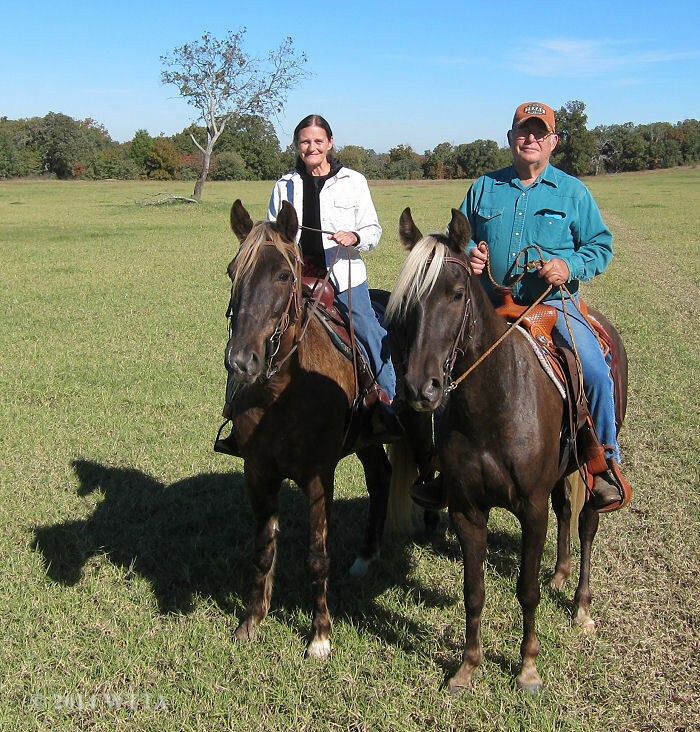 Paul and Doreen enjoy their American Indian Horses, Who Are You and Sing, with NETASA at Trace Trails. A wide sandy path at Trace Trails. Copyright © 2019 Where The Trails Are.... All Rights Reserved.